Welcome to Bunny Week 2018! Bunny Week is an annual tradition at My Creative Life. Each year in March, I dedicate a week of the blog to All Things Rabbit. It's like Shark Week, but fuzzier. 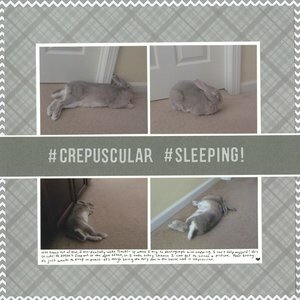 I'm starting off Bunny Week 2018 with a layout featuring Trouble, the best rabbit ever. Rabbits are not nocturnal, nor are they diurnal. They're crepuscular, which means they are active at dawn and dusk. This is part of what makes them such great pets. They're awake in the mornings when people are up. They sleep during the work hours, then are active again in the early evening when people are home from work or school. Then they sleep the same hours at night that people do. Trouble is up at the crack of dawn and active until around 9:00 am. Then he settles in for a series of naps. Often, he sleeps at my feet, on my feet, or nearby as I work. He'll change nap locations a few times, but generally dozes until late afternoon. Then he's active until 9:00 pm, when he settles in for the night. I did not know that about rabbits!! Very cool!!! Of course I am now thinking Dandy might be part rabbit!! HA!!!! Love this!!!!!! !